[117 Pages Report] The managed file transfer market size is estimated to grow from USD 939.5 Million in 2015 to USD 1,524.2 Million by 2020, at a CAGR of 10.2%. Managed file transfer solutions provide a secure, real-time file transfer within the network as well as across a range of other platforms. These solutions are being widely adopted by sectors such as banking, financial services and insurance (BFSI) and healthcare and life sciences. They are also being implemented by government institutions and IT & telecommunications to enhance the business processes and facilitate integration. 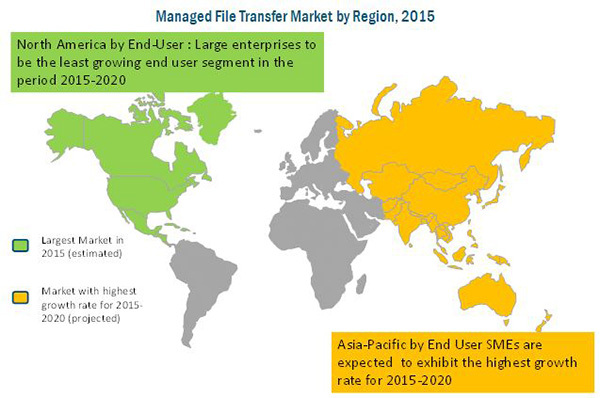 The report aims at estimating the market size and future growth potential of the managed file transfer market across different segments, such as solutions, services, verticals, deployment types, end users, and regions. The base year considered for the study is 2014 and the market size is estimated from 2015 to 2020. However, the bigger firms in the market are increasingly acquiring small players in an attempt to expand their offerings across the globe. Organizations in the BFSI industry vertical are rapidly deploying managed file transfer solutions to facilitate faster on-boarding of new trading partners, better system availability and improved compliance through various applications in payment consolidation, DLP, images check, and claims processing. The managed file transfer ecosystem consists of managed file transfer solution vendors, such as IBM, Axway, Attunity, Ipswitch, GlobalSCAPE, Accellion, Coviant Software Corporation, OpenText, SAISON INFORMATION SYSTEMS CO. LTD., JSCAPE, Safe-T, and others sell their managed file transfer solutions and services to end users to cater to their unique business requirements. The global market size is estimated to grow from USD 827.6 Million in 2015 to USD 1524.2 Million by 2020, at a CAGR of 10.2%. The managed file transfer market for industries such as banking, financial services, and insurance (BFSI) and healthcare and life sciences is anticipated to grow steadily in the next few years, as these verticals have been facing unique challenges of information security threats and growing compliance requirements. Managed file transfer helps organizations to eliminate such security, compliance, and governance shortcomings involved in information sharing, whether internal and external to them. Furthermore, the market is expected to be driven by opportunities such as rising trend in application integration and cloud-based managed file transfer solutions. The managed file transfer market has been segmented by type of solution, by type of service, by deployment type, by vertical, by end user, and by region. Among the solutions, application-centric managed file transfer solutions segment is expected to hold the largest market share. Among the deployment types, on-premises deployment is expected to dominate the market in terms of market size. On the basis of end users, large enterprises are estimated to hold the largest share as they are adopting managed file transfer solutions extensively to confront their business challenges; however, cloud-based solutions are gaining traction among the Small and Medium Enterprises (SMEs). The market by region covers five major regional segments, namely, North America, Asia-Pacific (APAC), Europe, Latin America, and Middle East and Africa (MEA). North America is estimated to hold the largest market share of the overall market in 2015, followed by Europe and APAC. APAC is expected to have the highest growth rate during the forecast period, and Latin America and MEA regions are expected to witness a record growth in demonstrating and adopting managed file transfer solutions. Organic growth through new product/service launch was the key strategy followed by companies such as GlobalSCAPE, Ipswitch, Accellion, JSCAPE, and IBM. This strategy accounted for 63% of the total strategic developments in the managed file transfer market during the period of 2012 to 2015. Furthermore, companies such as Axway, Attunity, GlobalSCAPE, JSCAPE, Ipswitch, and IBM have also adopted strategic partnerships and collaborations as an eminent strategy to enhance their product offerings and distribution networks in the local market. This strategy accounted for 25% of the total strategic developments in the market. However, stiff competition from file sync and share services is restraining the growth of the market.